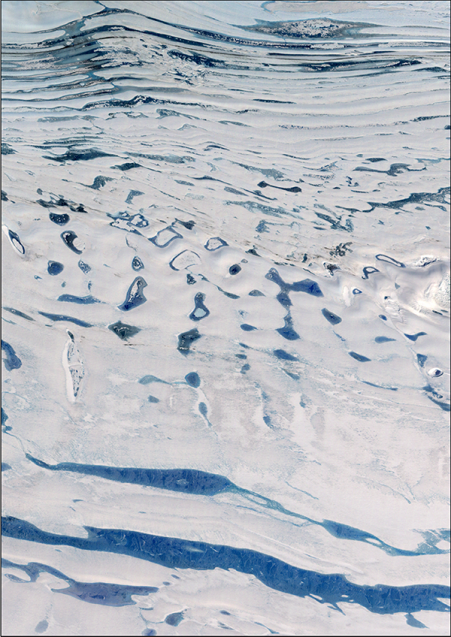 Scientists have discovered that seasonally flowing streams fringe much of Antarctica’s ice. Each red ‘X’ represents a separate drainage. Up to now, such features were thought to exist mainly on the far northerly Antarctic Peninsula (upper left). 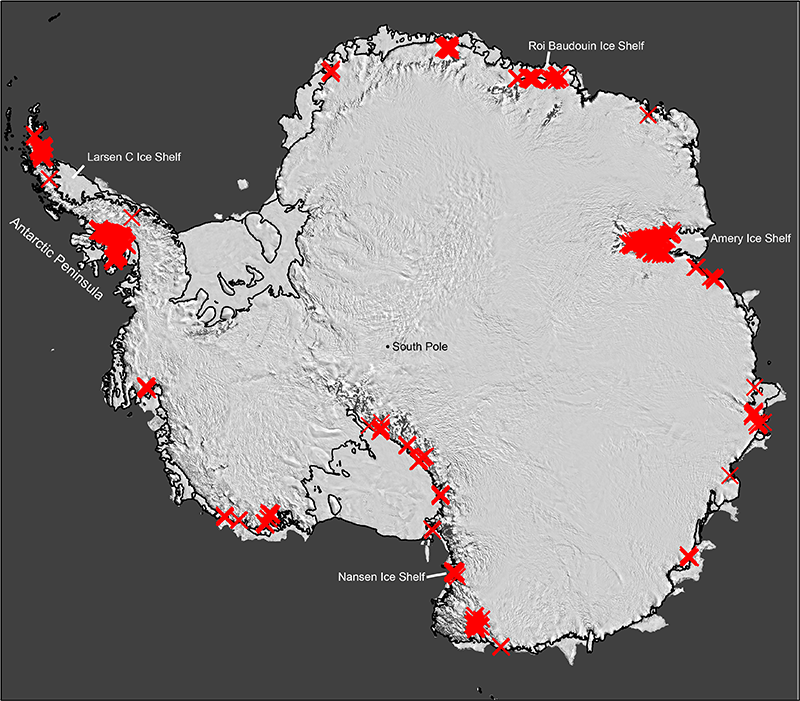 Their widespread presence signals that the ice may be more vulnerable to melting than previously thought. Image adapted from Kingslake et al., Nature 2017. Near the other pole, seasonal melt streams and ponds are far more common on the fast-warming Greenland ice sheet, and their growing influence may hold lessons. In recent years as much as 90 percent of Greenland’s ice surface has undergone some degree of seasonal melting. Much of the water probably stays at or near the surface and refreezes in winter. But in some areas, it is plunging through deep holes to underlying rock, lubricating glaciers’ slide to the sea. In others, water may be refreezing near the surface into solid sheets that can more easily channel surface melt to the sea in succeeding seasons. Until recently, icebergs discharged from glaciers were Greenland’s main contributor to sea-level rise. But between 2011 and 2014, 70 percent of the 269 billion tons of Greenland’s ice and snow lost to the ocean came directly from meltwater, not icebergs. This article was corrected on 4/20/2017 to reflect that Greenland lost an estimated 269 billion tons of ice and snow from 2011 to 2014. It is an alarming situation and is caused due to the emission of greenhouse gases.